CMA Planning secured permission from the London Borough of Ealing in May 2014 for this 26 home scheme for Family Mosaic. 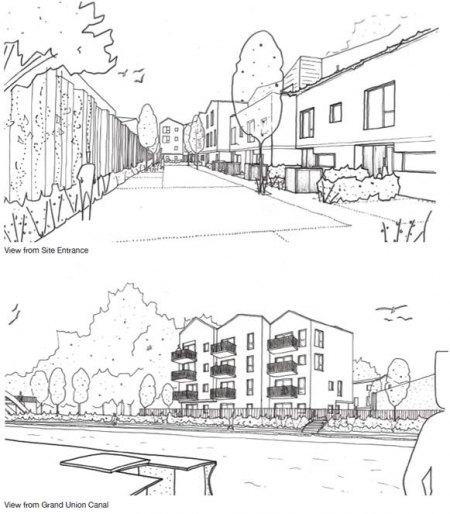 The proposal, located in suburban Southall contains four townhouses and 22 flats and in overall terms will see 54% affordable housing delivered. The development responds to the diverse surrounding context and the long narrow site, by having the two storey townhouses locate the site entrance, to relate to adjoining existing pairs of semi-detached housing. The building mass then increases along the length of the site, culminating in a four storey block of flats which would have good views over the adjoining Grand Union Canal. The scheme has been designed to Lifetime Homes standards throughout, with unit sizes that meet or exceed the Mayor’s London Housing Design Guide standards. The development has also been designed to meet Code for Sustainable Homes Level 4. In obtaining approval, CMA also overcame issues which included height, density, parking, level of amenity space, impact on adjoining trees, relationship of flats to a nearby phone mast and the level of s106 contributions.